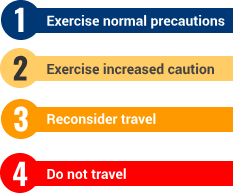 More than 170 countries around the world have current Travel Warnings from the Australian Government, ranging from Do Not Travel to a reminder to Exercise Normal Safety Precautions. Travel Warnings are often issued due to political unrest; critical weather events like storms, floods, wildfires, hurricanes and volcano activity; an increased risk from pick-pockets, who often work in teams to distract travelers while their colleagues go to work (many are kids); diseases; crimes involving kidnapping, drugs or personal safety; and many other reasons. Every traveler should keep abreast of these events and fully understand what each level of warning means and whether your insurance fully covers you if you enter a country or region after a warning has been issued. During September 2018 the Australian Government issued new travel warnings for 25 countries, and there are now 12 countries where Australians are warned "Do Not Travel". Residents are also warned to "Reconsider Your Need To Travel" in 14 countries. ​In addition, there are now 65 countries where travelers are warned to exercise a "High Degree of Caution" and 82 countries where we are told to "Exercise Normal Safety Precautions" - a reminder to be extra aware of our environment. Travelers are reminded to keep up to date with all warnings on offical government websites no matter where you call home. In Australia go to www.smartraveller.gov.au as some countries may have multiple warnings (i.e. Do Not Travel in some regions and Reconsider the Need To Travel in others). Warnings can also change on a daily basis.